I'm in the process of replacing what I believe is a blown sprag. I can't say for sure as I haven't got to it yet to see if it really has gone, or if it's something more sinister. I took the clutch plates off and very carefully placed them in the same order that they came off on a nice clean surface. I'm not sure if you need to keep them in the same order but worked on the idea that it couldn't do any harm. As I placed the last plate in the pile I heard a couple of metallic clicks. Lying in the middle of the plates on the back of the pressure plate was one small ball about 6mm dia and one roller about 6mm. 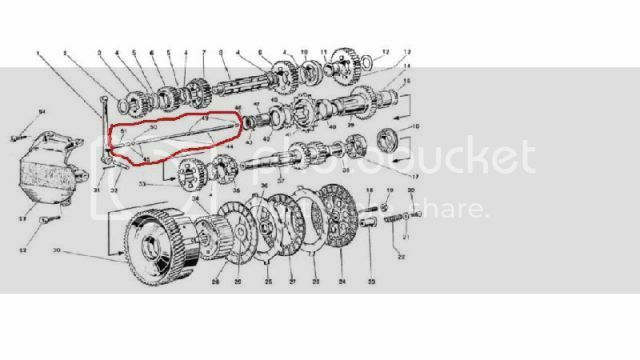 I've had a look at the exploded diagram in my workshop manual and can't see anything in that part of the clutch that should have these two items. pilotg wrote: ... one small ball about 6mm dia and one roller about 6mm. Just the last two clutch push rods, surely? Thanks for getting back to me so soon Craig. I saw those push rods in the diagram myself and figured that the last one, the roller, could have come out on its own. The ball has me a little more worried as I haven't removed the rods themselves. Could it really have migrated all the way past the longer rods on its own? I have a horrible feeling I'm going to have to pull more apart than I bargained for. I'm away for a couple of days now so won't be able to check what exactly has happened. I'll let you know then. possible that previous owner re-assembled clutch push rods/balls in wrong order. Remove all rods and see what you have got in comparison to diagram. Thanks Mick, we're on the same page. Unless someone had a better idea that was my plan of action. The guy seems to have been quite the plonker so why should I assume he put it back together right in the first place. I don't see that it will have done much damage in that configuration but we'll see when it's in bits.